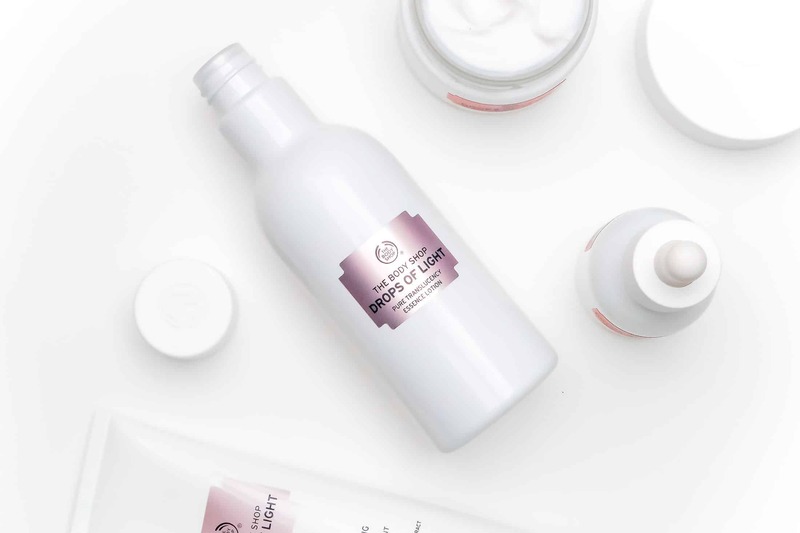 The Body Shop has a track record in Asian skin care with their original range – Moisture White. This was back in the day (when I worked in one of the shops through College funnily enough) and it was only available in the flagship stores on very, very limited availability. 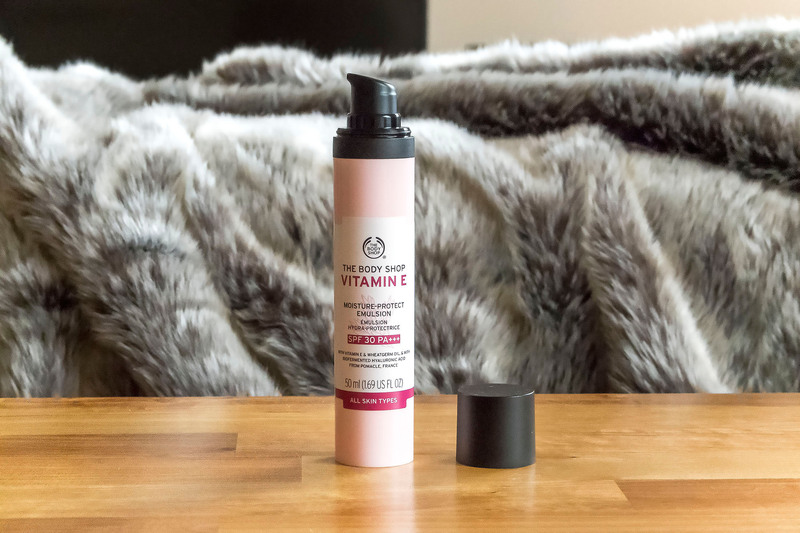 The brightening and clarifying range was incredible; I particularly remember the foaming powder you blended with a little water; it was great for hydrating and nourishing oil prone skin types. The range was later repackaged and available in the US and Asia; but we never saw it again in the UK. Do Asian people want to be white? Well, not really; it’s not that simple but I’ll try and explain. Japanese was part of my undergrad and I’ve been studying the language and its culture for over 10 years; skin whitening is something that comes up often. It is not a race thing. The only people who tend to get offended about it is other white people, not understanding its roots. In western culture it’s very sought after to have a tan and be brown – yet we correctly do not equate this to racism. No, this has its roots in a time when people had less expendable income and couldn’t afford to get away on holiday each year; so if you had a tan, you were obviously travelled and therefore wealthy. In Asia, where a lot of it can be pretty bloomin’ sunny and warm, going back hundreds of years: if you were very brown, it was a connotation of being a labourer; that you were out in the fields all day. But if you were fairer skinned, it showed that you were someone of leisure and opulance; sat, guarded indoors or under a parasol. Again, a sign of wealth. The parasol originated in China! There are other schools of thought but this is the most widely regarded theory of why many East-Asian people seek whiter/lighter/brighter complexions. People in Asia use skin bleaching (of which Drops of Light is not) just as people in the US and Europe have tanning injections – two extreme ends of the same scale. So now we know the why, but what about the how? The Body Shops new Drops of Light range is designed to brighten skin and even out skin tone. 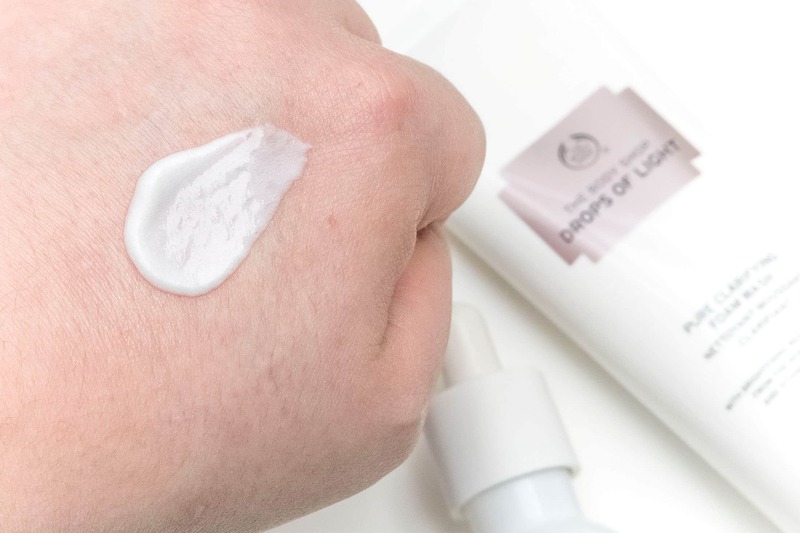 Loaded with brightening ingredients such as Vitamin C and skin repairing Red Algae, Drops of Light is designed for a normal/combination skin type that hydrates and nourishes without oiliness and greasiness. 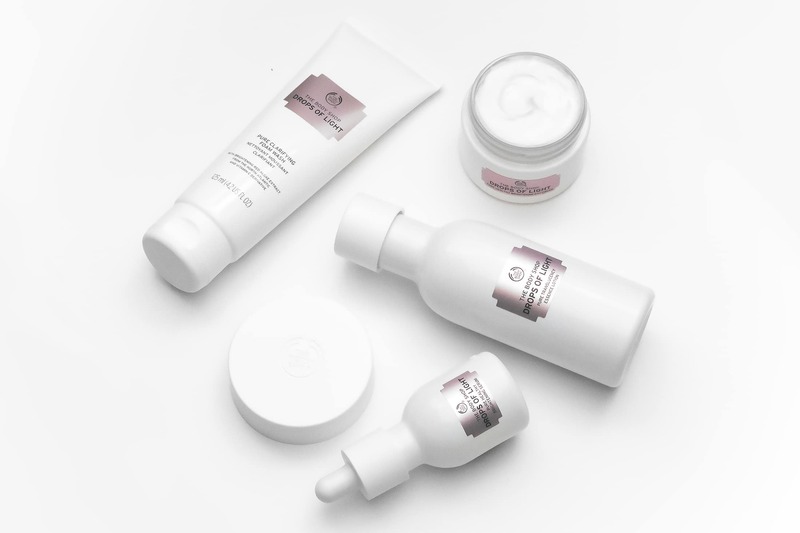 The range has 4 key products: Drops of Light Brightening Cleansing Foam, Drops of Light Brightening Essence Lotion, Drops of Light Brightening Serum and the Drops of Light Brightening Day Cream. Definitely one of the creamiest facial washes I’ve ever used and great for normal/oily skin types. It’s designed to deeply cleanse the skin and remove dirt/debris without stripping the skin. Use only the tiniest amount as I used what I’d consider a ‘normal’ amount, creating more silky lather than anyone could ever need. 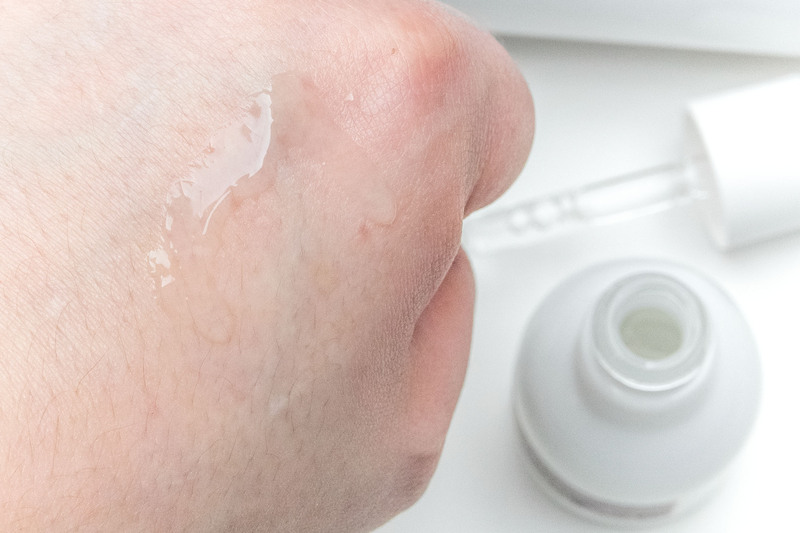 For me it’s a touch too soapy and left my skin a little ‘squeeky’ clean, but as soon as I’d patted my skin dry, it definitely didn’t feel stripped or dry. Drops of Light Brightening Cleansing Foam is available here for £12. Aqua/Water (Solvent), Myristic Acid (Emulsifier/Surfactant), Glycerin (Humectant), Stearic Acid (Emulsifying Agent), Lauric Acid (Surfactant – Cleansing Agent), Potassium Cocoyl Glycinate (Surfactant), Potassium Hydroxide (pH Adjuster), Glycol Distearate (Viscosity Controlling Agent), Butylene Glycol (Humectant), Acrylates Copolymer (Stabiliser), Sodium Cocoamphoacetate (Surfactant), Phenoxyethanol (Preservative), Caprylyl Glycol (Skin Conditioning Agent), Polyquaternium-39 (Film Former), Parfum/Fragrance (Fragrance Ingredient), Sodium Chloride (Viscosity Controlling Agent), Sclerocarya Birrea Seed Oil (Skin Conditioning Agent – Emollient), Tetrasodium EDTA (Chelating Agent), Linalool (Fragrance Ingredient), Sodium Benzoate (Preservative), 3-O-Ethyl Ascorbic Acid (Skin Conditioning Agent), Palmaria Palmata Extract (Skin Conditioning Agent). The all new 4th step. Essence Lotions like The Body Shop Drops of Youth, La Mer The Essence, L’Occitane Immortelle Divine Lotion or Bobbi Brown Extra Treatment Lotion are all used in between cleansing and applying your moisturiser and/or serum. These lightweight gel lotions are designed to deliver a small amount of treatment but mainly prep the skin after cleansing to help whatever is applied on top to be pulled further down into the skin. 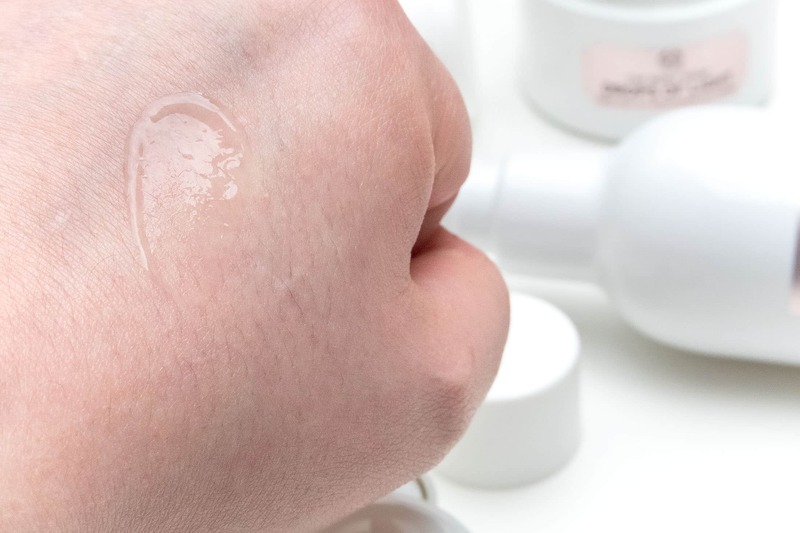 The Drops of Light Brightening Essence Lotion is a really gel-like formula with Aloe Vera juice but after water and hydrating glycerin there is a little alcohol which you can’t really feel or smell, but just beware it’s there if you’re sensitive. Apply a generous amount onto the ends of your fingers and massage into the whole face avoiding the eye area. This will sink in very, very quickly and your skin is now prepped to take on your serum or moisturiser. 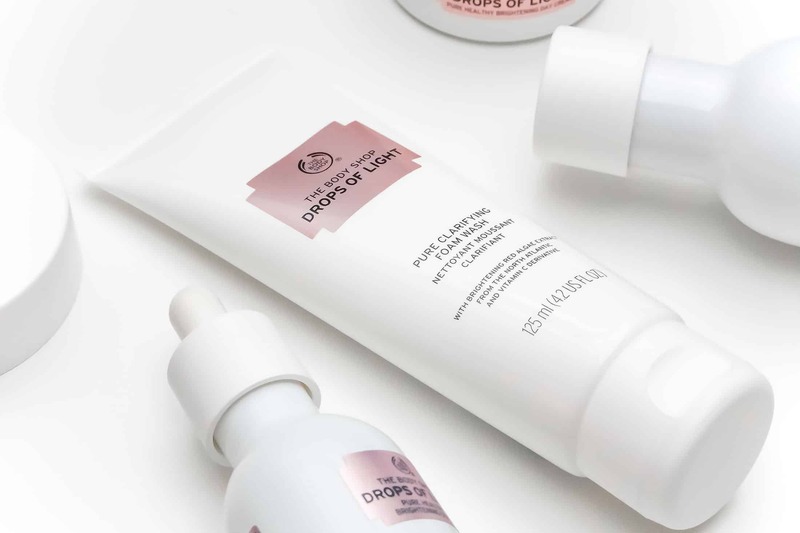 Drops of Light Brightening Essence Lotion is available here for £14. I love the serum. The texture, the feeling, the softness and even the very, very soft fragrance. Not only does it deliver a concentrated surge of brightening and reparative ingredients but it also leaves the skin shine free. In fact from start to finish you’re left looking dewy but without a trace of grease/shine. The serum has been clinically trialled and proven to reduce the appearance of hyperpigmentation/dark spots and brighten the skin’s overall appearance. What I did like to see was that from all the reviews, 94% would recommend to a friend and have given it 4.4/5 stars overall. I also enjoyed seeing the addition of Salicylic Acid in here too which helps break down the bonds of dead skin cells which when removed, will make the skin look immediately brighter. Apply a small amount from the pipette morning and night after the Essence Lotion but before moisturising. Again, with it being very light it sinks in almost instantly. There is a touch of alcohol again which isn’t noticeable but still just watch it around your eye area. 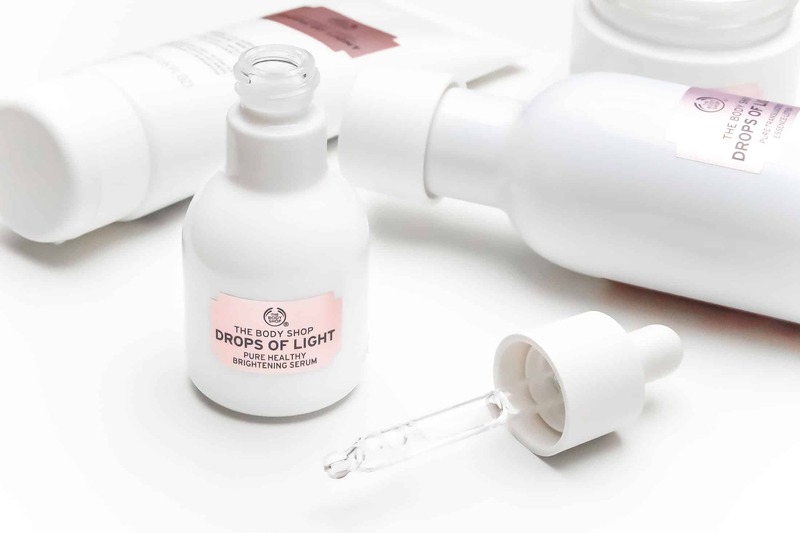 Drops of Light Brightening Serum is available here for £25. Due to being called a day cream rather than just ‘moisturiser’, this would hint that a night cream is on its way if the range does well (a mask would be fab too whilst we’re at it). 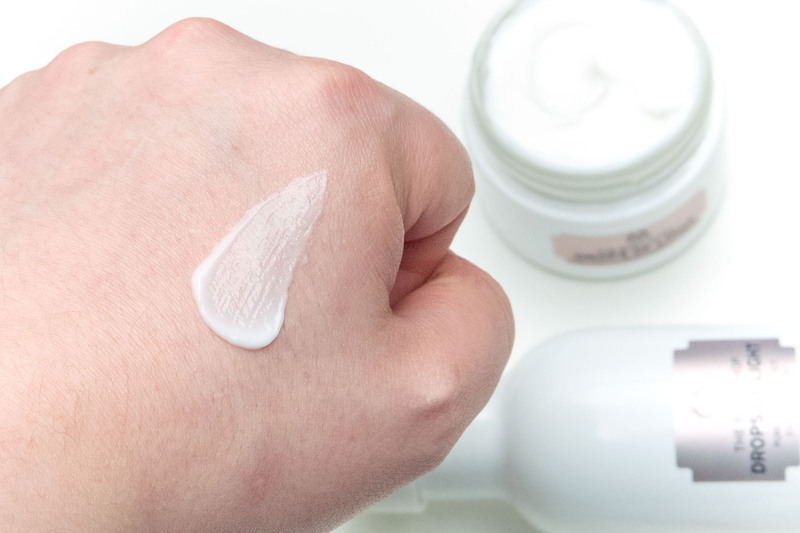 The Drops of Light Brightening Day Cream is very light weight texture despite feeling quite rich before applying to the skin. It has a gorgeous, gentle fragrance and although disappears, leaves the surface of the skin well hydrated and dewy/matt. Again it’s clinically tested and proven to reduce the size and intensity of hyperpigmentation/dark spots (more specifics on that including percentages etc would have been helpful) through the vitamin C and red algae formulation. It’s also designed to clarify and hydrate with Salicylic Acid, Rose water, beeswax and aloe vera. The Salicylic Acid will also help to reduce pore size by helping to slough off dead skin cells during the day. Morning and night, apply a small amount into your finger ends, gently warm it and then press into the skin. This helps the product absorb and lets the skin do the work rather than trying to force it in. I really do like how it feels and lasts all day without my skin going tight or dehydrated! 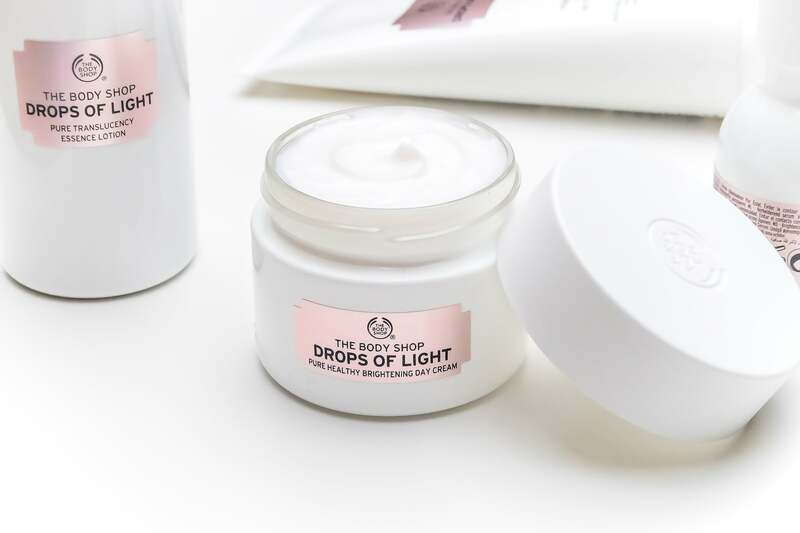 Drops of Light Brightening Day Cream is available here for £20. If it’s brightening, why isn’t there an SPF? 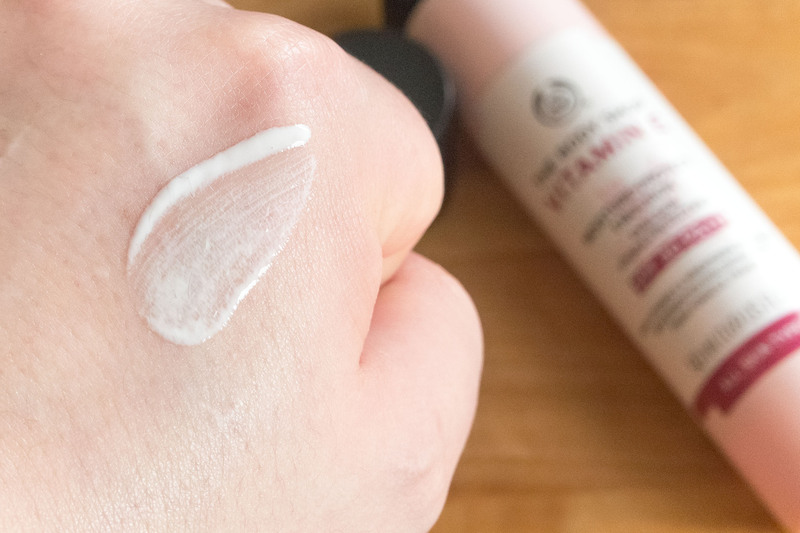 I won’t go into depth now, but The Body Shop are about to launch the Vitamin E Moisture Protect Emulsion SPF30 PA+++. It’s super-lightweight, smells great and will provide you all the UK sun protection you’ll need. I’ll be reviewing this later on this week or next! It’s not currently available but will be very soon. This can definitely be used with the Drops of Light range and applied after the Day Cream. This article first appeared on MANFACE written by Thom Watson. It was published on Monday 25th April 2016 and was last updated on Monday 3rd April 2017 at 1:03pm. It's categorised under Cleanse, Combination Skin, Dark Spots / Pigmentation, Moisturise, Oily Skin, Serums & Treatments, Sun Protect, The Body Shop where you'll find more related content. I find the cleanser to be good but not nearly as great as the moisture white cleansign foam was, the rest of the products are fine in texture and they seem to be doing what they claim to. There is just one little obnoxious thing about the cream… It has little micro shimmer in it! And it’s so frustrating to me because even though people around might not notice it, since I do, I can’t just use this one comfortably during the day, hence I am obligated to use it only at night time which is not bad but still disappointing in a way. This is skin care, not make up… There is no need for the shimmer to be there.